Rick, believing that soon those who enter Manhattan below 86th Street in a car will face Mayor Bloomberg’s traffic control toll, wanted to grant the commuters among us, Gerry, Mike from Yonkers, and Eugene, one last toll-free foray into midtown. But trying to find a midtown destination that fulfills our stringent criteria is a serious challenge. After much deliberation, he finally narrowed his choice between two Korean restaurants in Koreatown, the area between 5th and 6th Avenues between 30th and 36th St, with 32nd Street being the most densely Korean block in the city; the enticingly-named Kom Tang Soot Bull House or Han Bat. Though dining at a place called the Soot Bull House would be memorable for the name alone, Rick, for no particular reason, choose Han Bat. When I was executing and reviewing contracts for a publishing company many years ago, there was a Chinese restaurant I frequented for their lunch special at the same location where Han Bat is now. It was Chinese a restaurant run by Koreans but with a Chinese menu, though kim chee, spicy Korean cabbage, was always available. At this most recent incarnation, if the owners are the same, any nods to Chinese food have been eliminated. At Han Bat it’s just straight ahead Korean minus the sometimes suffocating smoke from table grills. There were five of us; Mike from Yonkers on a Southern road trip was absent. Once we all arrived we were hustled to our reserved table. Reservations are usually never needed on our unique expeditions, but it was a good thing Rick secured one; Han Bat, on this particular Tuesday evening, was mobbed. Menus adorned with color photographs of a variety of the dishes offered were distributed and before we had a chance to even glance at them, a waiter appeared and asked if we were ready to order. 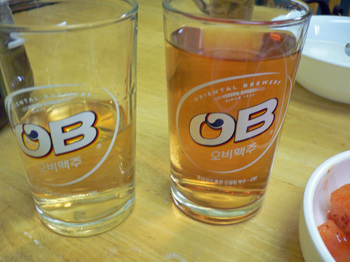 We were ready to order beer, but nothing else and before the bottles of OB Korean beer were delivered to the table, another waiter appeared again asking if we were ready to order. It was clear that there would be no chance of consultation of the menu with the wait staff at Han Bat. 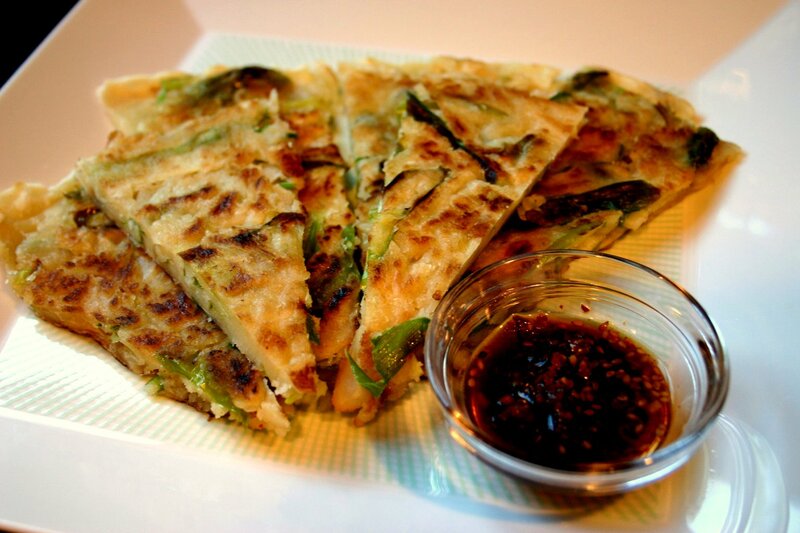 If you are familiar with Korean food, Han Bat offered the standards, but Korean standards can be exotic. On Han Bat’s menu were items like “ox-knee” meat, “jello extracted from ox-leg,” broiled meat, tongue and spleen, beef intestines, and something called yook hoe, shredded raw beef marinated in seasoned sesame oil. After the impenetrable cow foot at Florence’s in Harlem at our last dinner, the yook hoe was as exotic as we were going to get at Han Bat. Since this was Rick’s choice, we let him pick out the dishes for us and he did not disappoint. The French, of course, celebrate uncooked hamburger with their famous tartare. Much more modest are the Koreans and their underrated yook hoe, featuring raw sliced beef marinated in sesame oil and hot peppers and served in a green salad. There were no complaints at our table that the meat was raw; in fact, the rich blood red appearance of the meat seemed to awaken Zio’s usually dormant primal cravings as he devoured his portion. 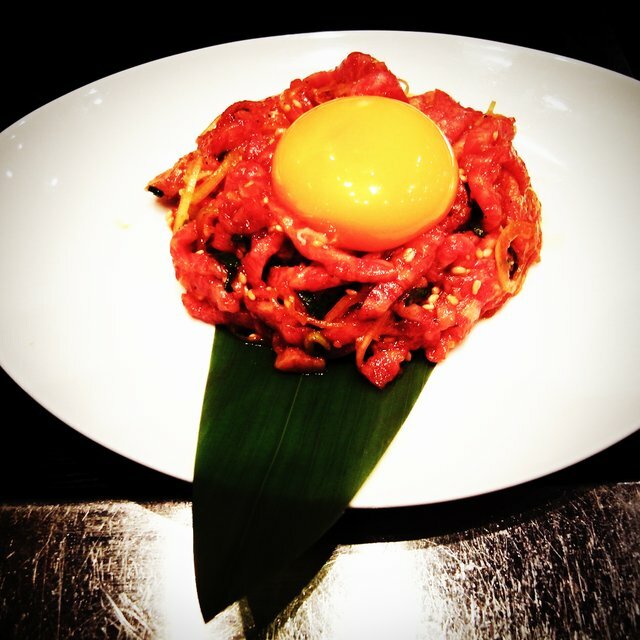 Though the yook hoe was in no way reminiscent to the French beef tartare, I detected cultural similarities in the ojinguh bokum, squid in a spicy sauce that came with a few strands of spaghetti making it somewhat like Italian linguini calamari while the jaeyuk bokum, pork shredded and tender in a tangy, tomato-based “special” sauce, reminded me of Southern pulled pork. Our final entrée was pajun, a choice based on one of the pictures on the menu and described as a “shell fish pan cake.” What we got was an accurate reproduction of the photograph with the shellfish in this case, being shrimp. Our group is notorious for the speed in which we can shove food into our mouths, but at Han Bat our eating pace was, compared to others in the restaurant, sluggish. We were still leisurely picking tiny pieces of raw beef from the lettuce on the yook hoe plate and scraping bits of crusty rice off the bottom of the now cool stone dish that held the bibimbab long after the check and orange slices were deposited on our table while most of the crowd of predominately Koreans, both men and women, who arrived at the restaurant when we did or after had long since sucked down their meals. The eating gusto displayed at Han Bat was on a level our group could only dream of attaining. 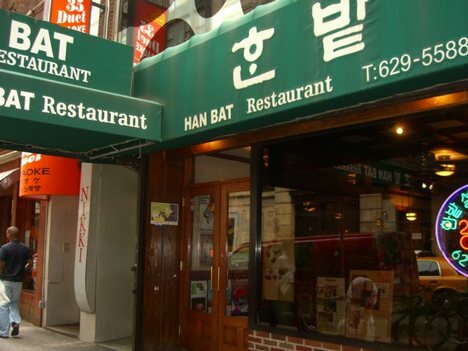 Han Bat remains on 35th Street; the menu virtually unchanged from when visited. And Mayor Bloomberg was not able to shove through his traffic control law. Ha you found the family favorite, although Cho dang gul next door runs a close second. Didn’t have the ox knee (tendon), faint of heart indeed! I’ve had it twice but the waiters usually ask me at least 3 times if I’m sure. and I am and my joints thank me! We also had all the other things you mentioned. What, no shochu? Its eanough to make me ignore my coconut allergy and guide you poor souls.